The John Deere 450K is the latest addition to the K-Series crawler dozer lineup. 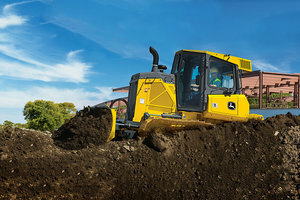 John Deere announced on January 17 that it will be expanding its crawler dozer lineup and updating its 550K and 650K models to meet evolving standards on job sites. The new 450K will be added to the line to provide an 80-horsepower option to customers. This model also has a John Deere 4.5-liter Final Tier 4 diesel engine, and it features Eco Mode to regulate engine RPM. The 450K has an impressive power-to-weight ratio and more drawbar pull than J-Series models. "The 450K, 550K and 650K are key models in the John Deere dozer lineup," said Nathan Horstman, crawler dozer product marketing manager at John Deere Construction & Forestry. "With the 450K, we focused on proven K-Series durability and fuel-saving technologies, and we updated the 550K and 650K models to offer enhanced reliability and serviceability upgrades to improve customers’ operating costs." The 550K and 650K models are being updated to incorporate John Deere 4.5-liter Final Tier 4 diesel engines with 92 horsepower and 104 horsepower, respectively. The 550K dozer has six undercarriage rollers, 86 inches of track on the ground, and more hydraulic motor capacity. The 650K dozer features seven undercarriage rollers and 92 inches of track on the ground. It also includes a cool-on-demand variable-speed fan that only runs as needed. All of the dozers can be used with Ultimate Uptime, featuring John Deere WorkSight for follow-up inspections and five years of JDLink telematics. Customers can contact their local John Deere dealer or visit www.JohnDeere.com for more information on the machines.